Yesterday when i am creating a database for a 11.1.0.7 database, I found it hanged at 89% and not moving ahead even after 1 hour. I started tracing the session and found that problem is with allowing “configure Enterprise Manager” option in one of DBCA screens. When i deselected the option and started DBCA, database creation completed in just 10min. So please do aware of this while implementing in production. Hi Friends, today one of my collegue faced a peculiar problem during Oracle 10gR2 installation on RHEL 5. We should have 644 permissions i.e read permission for that file to oracle user and root should be the owner of the file. In our case, we don’t have read permission for oracle user, so it was unable to identify the location of oraInventory. 2) After fixing above package, your runInstaller will be started successfully, but still you may get error at the time of linking the files. This is again due to some packages missing or when you try to install 32bit oracle on 64-bit operating system. once everything is ready, you will be done with installation…. 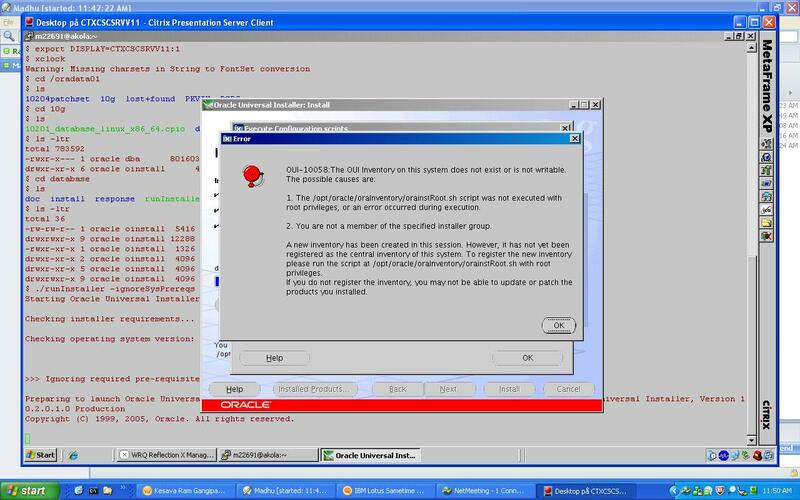 Yesterday i was trying to install oracle 10g client (10.2.0.1) on a windows 2008 server machine. hope this will help you in your future installations !!! When trying to install the Oracle10gR2 (10.2) software on a Red Hat Enterprise Linux release 5 (RHEL5) server, the prerequisite checks fail. This is a prerequisite condition to test whether the Oracle software is certified on the current O/S. Oracle10gR2 (10.2) was released before RHEL5, so the base installation media does not make provision for installing on RHEL5. If you are installing 10.2 from DVD, copy the <path>/database/install/oraparam.ini to a temporary directory (for example, /tmp). Save the changes to refhost.xml and perform the 10.2 software installation. If you would prefer not to change the refhost.xml file, please manually check that your RHEL5 server meets all of the prerequisites defined in Note:419646.1 and then check the boxes on the “Product Specific Prerequisite Checks” page in OUI to confirm that you have performed manual verification. This should allow the 10.2 software installation to continue.